From Activist to Zapatista, this “children’s book for the 99 percent” infuses the alphabet with the energy and consciousness of Occupy Wall Street. B is for banner, bobbing in the sky. It’s pretty clear from page one that this is no Cat in the Hat. Billed as a book for the children of the 99%, A is for Activist is the radical vision of Innosanto (Inno) Nagara, a graphic designer and social justice activist from Oakland, California. Like most parents, Nagara had little trouble finding books with colorful pictures and fun rhymes to inspire a love of words in his young son. But after reading aloud hundreds of tales featuring princesses, knights, and dogs, the absence of progressive themes in children’s books became abundantly clear. So Nagara decided to rectify the shortage, despite having zero experience as a children’s book author (or any other kind of author, for that matter). The original plan called for limited press run—one copy for Nagara’s son and a few others for close family and friends. But as it turned out, Nagara was not the only parent hungry for end rhymes featuring revolutionaries and social-justice luminaries. A is for Activist blossomed, as coworkers helped generate content, and a Kickstarter campaign defrayed the cost of development. After seven months of design, writing, revision, and a self-taught course in self-publishing, Nagara produced an ABC book with a decidedly un-Disney outlook. The alliteration and rhymes have the rhythm and fun of standard ABC books, burrowing into little ears and prompting memorization and spontaneous recitation. “It’s pretty awesome to hear a three year old saying ‘union power,’” Nagara says. Throughout the alphabet, topics ignored by most toddler tomes at last get their due. Cooperative workplaces. Unions. Feminism. Immigrant rights. The challenging content raises the question whether Nagara considered changing the message, perhaps to appeal to a broader readership. “Sure, there were moments when I thought, maybe I should change this…but then I thought, why write the book at all if the message was going to be diluted?” Nagara said. And for all the families out there eager to transmit their values at story time, it is indeed vital. 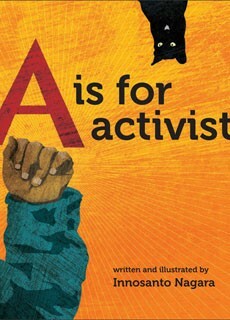 After all, there aren’t too many alphabet books that begin with Activists and end with Zapatistas. From shutting down toxic waste facilities to making colleges more affordable, young people all over America put their energies into remarkable actions for their communities, and for the world. The late poet was a patriot who wrestled for the soul of her country. How the poet, activist, and Pulitzer Prize-winning author has changed the world with her words.